Boost volume and control as you style with this light mist, containing lemon zest and oats to infuse hair with shine and strength for a full, glossy finish. Suitable for all hair types. 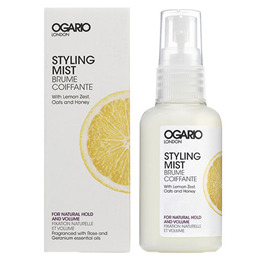 Ogario London Styling Mist for Natural Hold and Volume contains innovative complex MICROKERA, which utilises microcapsules of keratin and argan oil to target damaged hair and seal split ends. Wash and condition the hair then soak up excess water with a towel, leaving hair damp. Gently shake bottle before use to activate then spray 2-3 times above the head, allowing the mist to settle onto the hair for a few seconds. Style as normal. Store in a cool place away from direct sunlight and sources of heat. Below are reviews of Ogario Styling Mist for Natural Hold and Volume - 60ml by bodykind customers. If you have tried this product we'd love to hear what you think so please leave a review.